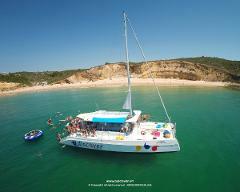 Beautiful half day cruise along the coastline of the Western Algarve. 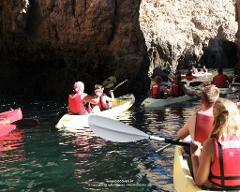 Experience and witness the amazing rock formations and beaches of Europe's best kept secret. Join our team on this journey which will be the highlight of your holidays. 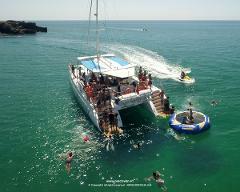 Enjoy this amazing Coastal cruise on our modern and spacious sailing catamaran along the cliffs and caves of Ponta Piedade, Porto de Mós and Praia da Luz and witness the unique rock formations and the golden beaches of the western Algarve. 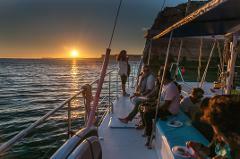 Enjoy the perfect end of day while cruising along the beautiful coastline of the western Algarve. Listen to live music while tasting local wines paired with rich Portuguese tappas. 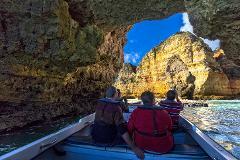 Enjoy an exciting and relaxed adventure by Kayak to the famous caves of Ponta da Piedade with the help of an experience and friendly guide. This 1h15min cruise takes you on a guided tour to the world famous caves of Ponta da Piedade and beaches of D.Ana, Camilo, Canavial, Porto de Mós and others.